Every month we will be putting a Monthly Newsletter onto our website to update ‘all’ our friends and guests around the globe. Due to the fact that I have not written a Newsletter for a while, this is an extra long one, packed full of gossip for you! Firstly I hope that you like our ‘new’ website that was launched only this month! It is packed full of information about our Seven Holiday Cottages and Facilities, Trout Fishing, Rare Breed Poultry Paddock, Local Attractions, Directions and Maps etc. I would appreciate all feedback, so please do drop me an email with your comments. Of course my thanks go to Brad Waters for this stunning website! Brad and I will be working closely in the future to make sure that this website remains fresh and in date. Brad is responsible for all the photos on this website, except the one taken by my good friend Graham Coker, which is the one showing the front of all the cottages. Thanks again to them both! I will continue to take the photos of the anglers with their catches myself. I would like to dedicate the launch of this new website to the loving memory of some special anglers and family of mine, who all had and still have a very special place in my heart! Ray Street, Ted Turner, Steve Parkhurst, Jason Norris, Gordon Bellman, Brian Easterbrook, Ewart Blowey, my dear Auntie Queenie and of course my late father Mr David Michael Underhill, who without I would never be here! Simon Jeffrey from Tavistock managed to catch the best fish during July and August and this was a lovely brown trout weighing 12lbs -4oz. This brown trout photo was featured in the Trout Fisherman magazine. Well done Simon! I hope to report more brown trout catches to you in my next Newsletter but large browns are easy for me to grow and it seems, harder for you to catch! This summer was obviously a very disappointing and wet one, as angler numbers were down considerably and so the fishery suffered! With our overheads rising daily and our business rates reaching an all time high of £7,000 a year, insurance £5,000 a year and fish food nearly £1,000 a ton, I would like to ask you all to support your local Stillwater here at Tavistock! The more you can use the facilities we have here, the stronger our future will be! Thanks to ‘all’ my loyal fly anglers for standing out on those wet miserable ‘summer’ days! When I first moved here in 1989 we had five old barns and no holiday cottages and now we have seven delightful cottages and apartments, offering fantastic holidays to guests from all around the globe. Half of my guests are either keen on fly fishing or they want to try it while they are here and the second half do ‘not’ want to fish at all and have chosen to stay here because of our perfect location, for not just visiting Devon but also Cornwall and the surrounding area! 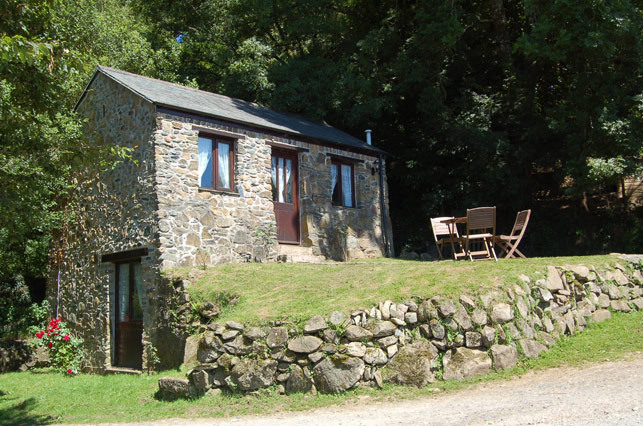 With The River Tavy running alongside the estate and the Cottages nestled in the Dartmoor National Park, it is a peaceful and calming environment with stunning facilities. 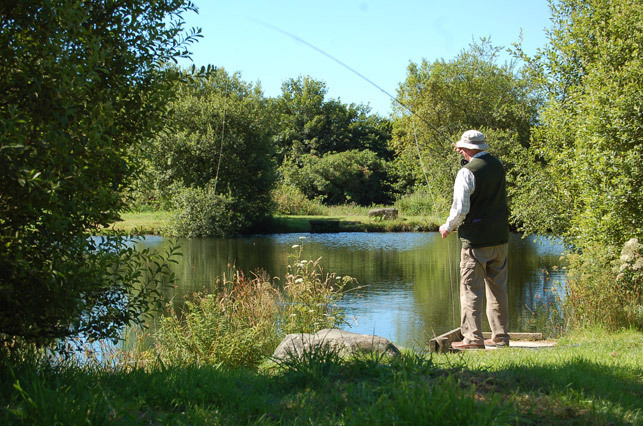 ‘Cottages On Dartmoor and Tavistock Trout Fishery’ is a perfect location for your holiday, whether you want to relax or explore, the choice is yours! Walkhampton Arts and Craft show was held in September and I managed to purchase an old painting of my barns, prior to them being converted. It was painted by Antony Race from Dousland in 1998 and it will be on show in the lodge during our celebration weekend 23rd and 24th March. It now proudly hangs in my house above the fireplace! I have since been in touch with Antony and he is visiting here next week to discuss painting some more scenes for me. I have just commissioned Gary Hammond from The Tavistock Pannier Market to design and paint 7 large black slate signs to go on the external walls of my cottages, with the name of the cottage and a bird etc. Gary will also be producing some work for me to sell from this December in our shop beside the lakes and also in our cottages. Unfortunately a fox has been and taken a few of our chickens and ducks that refused to go in our safe sheds at night, so if you know of any that would like a lovely home, please get in touch. We keep the majority of our chickens and ducks locked up at night or they rest on the island in Heron Lake. All varieties welcome! Below is a brief outline about what is happening in the next few months here at ‘Cottages On Dartmoor and Tavistock Trout Fishery’. 7th October 2012 – Fly Fishing Competition open to all anglers on Sunday 7th October! Cost – £29.00 for 6 fish – Prize Engraved Tankard and Snowbee Fishing Bag. We still have places, so please ring and book in. Details of our Christmas Competition will be in Novembers Newsletter! 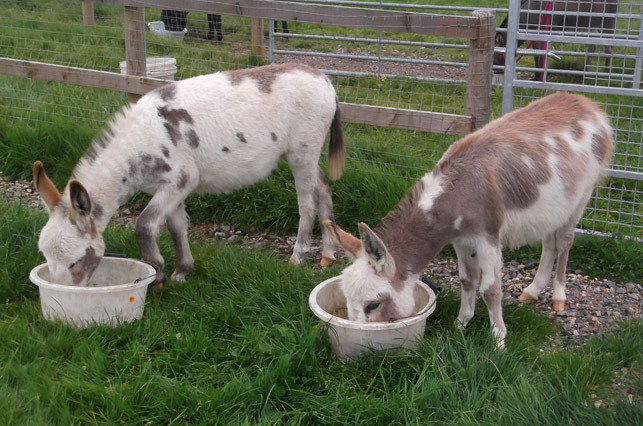 7th October 2012 – Our two miniature donkeys, ‘Pollyanna’ and ‘Domino’ will be arriving at our beautiful grounds on the Sunday. If you would like to see them being delivered, please ring in the morning and obtain an ETA. End October 2012 – Our new Cattle Grid will be installed near to David’s Bridge by Gregory Fencing. This will enable us to give more animals a lovely home here in The Dartmoor National Park. Alice and Perky our two Vietnamese pot bellied pigs do not want to roam over our bridge and yet are roaming freely everyday but our younger Micro pigs and our ginger Kunekune pig called ‘Geri Halliwell’ are very inquisitive and I am sure they will try venture over sooner or later, so I am going to put a stop to that! Mid December 2012 – I am hoping to install a live webcam in one of our stew ponds, so that anglers will be able to see some of my prize fish! I will keep you updated! 22nd March 2013 – ‘Red, Rose and White Wine’ with our own label will be introduced as part of our arrival package for all guests booking a week. Guests will receive a bottle in the cottage on arrival, along with a selection of tea/coffee and milk. Guests are welcome to request a bottle of Red, Rose or White prior to arriving. 23rd March 2013 – I suppose that the most exciting news that I have for you, is that after over 5 years without our big fish lakes, I have decided to return both Osprey lakes to big fish from 23rd March. Over the last few years I have been feeding and growing a lot of my Triploid Rainbow and Brown Trout and I am going to try for the British Record again! The Triploid Rainbow Trout that I obtained the British record with last time was called ‘Bertha’ and she is stuffed and on show in our Tackle Shop at the heart of this lovely fishery. Bertha was grown here from the size of a very small fingerling trout and my ambition is to do it again! So either, come fishing and try to catch one of my specimens or watch this space! 23rd March 2013 – The second most exciting news for you is that due to popular demand, I will also be increasing the size of fish in our Kingfisher and Heron Lakes, to a minimum stock size of 2lbs! Anglers have requested that they would like a heavier average and so I will again be implementing this from the 23rd March 2013. As you would expect both these changes will cause our fishing prices to increase but I will look at this closely over the winter and inform you all as soon as possible, at the very latest in my February Newsletter. 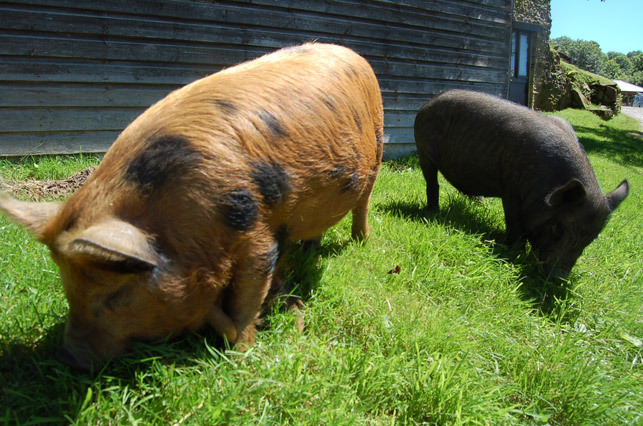 23rd March 2013 – Our Rare Breed Poultry Paddock will open on the 23rd March with a variety on chickens, ginger Kunekune pig, three Micro pigs and our two Mediterranean miniature donkeys etc on show. Guests will also be able to see our large brown trout and feed some trout too! There will be a small charge to enter this paddock and this will help towards the feed for all our animals. See our Rare Breed Poultry Paddock page for more details. 23rd and 24th March will be our special celebration weekend, where we will be toasting the completion of all our barn conversions, the final phase of improvements to the grounds, the opening of our Rare Breed Poultry Paddock and the Opening of our Big Fish Lakes! So why not book a fantastic holiday to remember, with Champagne on arrival on Friday 22nd March! Email or ring for more details or to book. Anglers, guests and friends are welcome to join us on Sat 23rd or Sun 24th March 2013 for a chat, free drink and nibbles to celebrate the completion of my 23 years hard work on our picturesque lakes, delightful cottages and gorgeous grounds! Open to anglers, non anglers, friends and visitors! More details to follow in the next Newsletter! A selection of our cottages will be kept for long lets this winter but Jack’s Den, Amelia’s Corner and Clearbrook Barn will be open for bookings throughout the winter. Charlottes Barn is also available to let for Xmas and New Year. It is possible that I will let another barn for winter bookings but I cannot confirm that, at this stage. All these properties have underfloor heating! In celebration of our new website going live at the end of September 2012, I have just decided to offer some amazing new ‘winter special offers’ in our cottages! They are reduced on my website for you to book! Fishing, towels, bathrobes and wine are not included in these weekly reduced prices! You will find the weekly prices on the appropriate cottage pages along with the short break ‘special offers’! 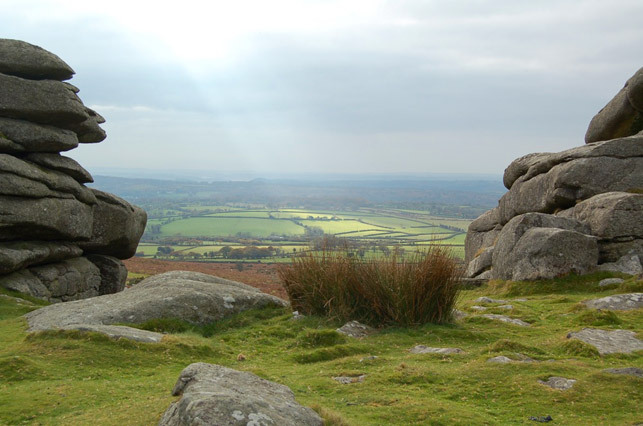 Have a look and book yourself a lovely break here in The Dartmoor National Park! Octobers Recipe – Every month I will be giving you a trout recipe! Some anglers don’t even eat their trout and that is such a shame! So give this recipe a go! Place 4oz/100g sliced button mushrooms on a base of dish, top with 2 Trout cutlets and season. Mix 2tbsp whisky with 1tbsp each lemon juice and honey, pour over Trout. Cover and cook on full power 6 mins, remove fish and keep warm. Mix 4 tbsp double cream with mushrooms and cook a further 2 mins. Pour sauce over cutlets and garnish with chopped parsley. Serve with new pots or chips and salad or vegetables! Yummy! If you would like to receive our Newsletter automatically every month, please fill in your email address here and you will be added to our list of free subscribers. Due to customer feedback, I will continue to answer the fishery phone myself and to try to reply to all emails within one hour. I wish you all tight lines for the coming Autumn Season!